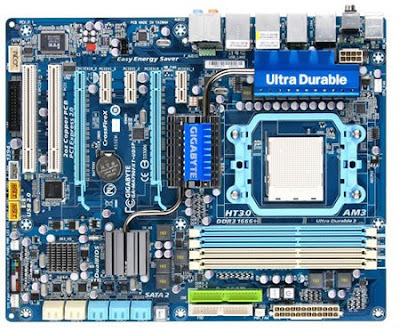 AM3 motherboards from Gigabyte and MSI | Its Madh !!! Gigabyte and MSI announced first motherboards based on the AMD's new "Dragon Platform" with socket AM3 and DDR3 support. Gigabyte announced GA-MA790FXT-UD5P with AMD 790 FX as northbridge. It supports effective clock rates upto 1,666 Mhz and processors with TDP upto 140 watts. Officially, AMD has released only DDR3 modules with a maximum clock of 1333 Mhz. It has other features like two PCI x16 slots, two Gigabyte Lan ports, a Power/Reset CMOS button, and a Dual BIOS. It also has 10 USB 2.0 and SATA ports. MSI announced AM3 platforms 790FX-GD70. It has 4 PCIe x16 slots, four Quad Crossfire support and upto 16 GB DDR- 1333 Mhz facilities including one PCIE x1 slot. It also has 12 USB and eSATA ports, with RAID support, 2 Firewire, SPDIF ( optical and analog ), HD audio and two Gigabit LAN ports. It is has new feature for Overclockers , called " OC-Dal " in which, the FSB clock can be changed. This facility is included in the BIOS. Another handly feature is " M-flash ". It allows the BIOS from a USB stick to flash it. This 790GX-G65 has onboard graphics in the form of Ati Radeon HD 3300 with HDMI, DVI and D-sub outputs. Also, the MSI sets the simplified naming conventions for their new motherboards. The product name of new motherboards, the first indication is the Chipsets. The 790FX-GD70 works with AMD 790 FX chipset. The 790GX-G65 with AMD 790GX integrated with "Radeon HD 3300" onboard graphics. The letter "G" indicates the "gaming" segment and "D" for the MSI's "DrMOS" technology of the second generation. The prices of both companies were not yet announced.